18" Necklace and earring set including: 18" necklace features two strands of cross-drilled green freshwater pearls separated randomly by clear crystals and fastened by a distinctive pewter toggle and loop clasp. Because all of our products are individually created we recommend that you contact us at Helen.PearlsbyHelen@gmail.com if you would like more details or to purchase this product so we may verify inventory. We'll respond quickly with instructions. 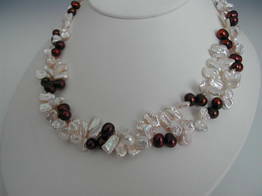 freshwater pearls with a gold-filled clasp. ​ this product so we may verify inventory. We'll respond quickly with instructions. 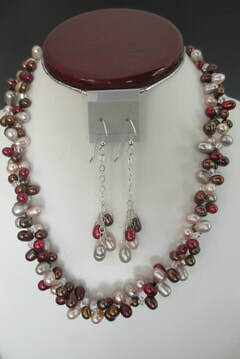 Necklace and earring set: 18" two-strand purple cross-drilled freshwater pearls interspersed with Swarovski crystals and closed with a sterling silver toggle clasp.